Editor’s Note: While the applications shown in this article are excerpted from Don Sorell’s new book, “Isshinryu Karate -The Practical Applications of Seisan Kata,” and thus are drawn from a specific kata, the reader will immediately recognize other possible applications in other kata. When examined in detail, multiple possibilities of application emerge. Two are presented in this article. The opponent attacks with a right (cross) punch. Block with your right hand across your body and strike his right wrist. Backfist the attacker’s nose. With both hands reach and grab the attacker’s wrist. Step toward the attacker, break his balance and rotate the attacker’s arm. Put your left elbow on top of the attacker’s elbow. Sit back and drop your weight on the attacker’s elbow and force him to the ground. When trying to find the applications in your kata, try to visualize what you might be doing. Nothing is set in stone and there are many techniques within your forms. Watch where the hands are set and follow their movement. For example, in many karate systems or styles they chamber at the shoulder before doing a down block. When the hand comes to the shoulder, it’s doing something. There are no wasted movements. Think about what could be happening. Also, watch the foot position and how the body moves – this suggests methods of how to get the body out of the way (ashi-sabaki and tai-sabaki). The waist also suggests what is happening with the entire body. There are also changes in timing. When practicing a technique, for example, perhaps a step or shift followed by a block, practice it this way. Then block first and then move or do both together. Add in what your extra movements might be or what is suggested by the slightest gesture. The attacker steps in with a left punch (cross). Use your right hand to block across the body. Backfist the attacker’s temple, then reach up with both hands and grab the attacker’s left wrist. Step toward the attacker and break his balance, turn the wrist and drop your weight as you set into a cat stance. I believe most moves in kata are directed toward countering six points of attack – those types of attacks which are most common. They include gestures, such as finger pointing or stabbing into the chest with a finger, a grab, push, basic kick (such as to the stomach or groin) or an attempted tackle. Start looking for defenses against these common first attacks. A spinning back roundhouse kick is possible, but amongst the general population, or amongst those with tight cloths, on uneven ground or less than very practiced karate-ka (some would say foolish), this type of attack is very unlikely. It fact during the time most traditional kata was being developed this type of attack most likely didn’t exist at all. Remember the old adage of “KISS” (keep it simple stupid). For the last 20 years or so I have been studying the kata and applications of kata within my own Isshinryu karate system. Above are several applications from the first kata in our system, Seisan. I spent approximately 300 hours filming applications from this kata, and then taking stills from the film. 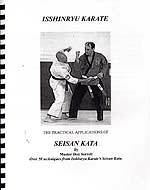 These applications are taken from my new book offered on FightingArts.com, “Isshinryu Karate: The Practical Applications of Seisan Kata.” In it I show defenses against grabs, chokes, tackles, combination punches --- more than 50 different techniques. While drawn from Seisan kata, if you examine these applications you will see movements from your own kata too. In this way you can learn some of the concepts and principles of kata, what they mean and how they work. Don Sorrel is a teacher of Isshinryu Karate with over 27 years experience in the martial arts. He is the author of the book “Isshinryu Karate: The Practical Applications of Seisan Kata,” various articles on applications of kata, and frequently gives seminars on the subject of kata applications. His training includes study of Kenpo (including study with Seiyu Oyata), Goju-ryu, Isshiryu (under Willie Adams, Tyrone Melton, Janice Roberts and Samuel G. Santilli), Shorin-ryu karate, Tae kwon do, Judo, Jujitsu, Judo, Aikido, and Tai Chi. Over many years he has actively researched kata through his training and cross training, assistance of many teachers and personal study, including historical research and development of a book/video library of source materials.